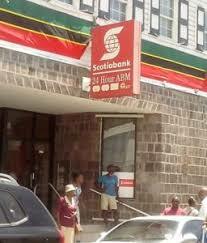 Scotia Bank in St. Kitts, on Fort Street. Basseterre, St. Kitts, Monday, 3rd December, 2018, (MyVueNews.com) – In the wake of the recent announcement that the Bank of Nova Scotia will be closing operations in 9 Caribbean countries, the Central Bank for the OECS, is urging citizens and residents in the region to remain calm and stay abreast of developments in the banking sector. The Eastern Caribbean Central Bank, (ECCB), confirmed that it has received an application from Republic Financial Holdings seeking regulatory approval to acquire the Bank of Nova Scotia’s operations and businesses in the Eastern Caribbean Currency Union (ECCU). They say that this application was received on Tuesday, 27 November, 2018. It further explained that the proposed transaction between Scotia and Republic Financial Holdings is the latest in a series of consolidation moves by the Canadian banks. And they add that it is distinctly possible that there could also be some consolidation moves among indigenous (national) banks and that Citizens and residents in the ECCU should come to expect these developments as part of the banks’ response to both global developments and competition in the ECCU banking space. Pursuant to the Banking Act, the ECCB said it has commenced its review of the application. In this regard, the ECCB has held initial discussions with the Central Bank of Trinidad and Tobago and the Bank of Guyana and the regulators will collaborate on the review of the application that pertains to Scotia operations in St. Maarten, St. Kitts & Nevis, Anguilla, Grenada, St. Lucia, Antigua & Barbuda, Guyana, St. Vincent & The Grenadines and Dominica. The ECCB said it will also confer with the Central Bank of St Maarten and Curacao, to help forge a more coordinated approach. In addition to its control over the banks in the OECS, ECCB also regulates the Trinidad based Republic Bank since it has an operation in Grenada. Republic also has a stake in a bank in Saint Lucia. As Bank of Nova Scotia tries to streamline its businesses the ECCB said it too has been encouraging indigenous (national) banks to cooperate and consolidate to ensure the interests of the people of the ECCU are best served.